I was itching to try my first furniture DIY makeover project, but really had no clue what it would be. I scoured thrift stores and resale stores, but anything I liked was too pricey in my opinion for a first attempt. Then I went to a few yard sales, and hit the jackpot! I found a gem that’s the perfect size for my living room, but definitely needed tlc. I was able to negotiate her down to $10…not bad! If I hated it, I would toss it, and for $10 I figured it was worth a shot. Unfortunately I can’t seem to find the full shot “before” pic,” but you’ll get a sense in the pics below. Electric sander (not pictured) with fine grit – oddly enough, I found this too at a yard sale a few weeks ago! You can see how beat up the wood was, especially in the molding on the legs. Also, there’s a metal piece at the foot of each leg (which I kinda liked), but I hated the matching fake drawer pull that was on the side of the table. I simply unscrewed the drawer pull with a screwdriver…easy peasy. Since I was keeping the metal legs, I taped them off so I wouldn’t accidentally paint or sand them. Then used the putty to fill in the drawer pull holes and “remold” the missing chunks on the legs. As the epoxy was drying, I took my electric sander and sanded down the finish on the entire piece, plus smoothed out any nicks. Once the epoxy was dry (about an hour dry time), I sanded down those areas too, and used the sanding sponge to get in the small molding crevices. I tried my best not to sand the entire thing too much, because I wanted to keep as much of the dark stain as possible. You can see here the natural wood color poking through, but I knew the darker finish would show up better during the distressing stage. Next, you want to prep to paint by getting off all the dust caused from sanding. Either wipe with a clean damp sponge, or you could try my trick. Blow that sucker off with a leaf blower! Worked like a charm. From there, I went straight into painting. I probably should’ve primed it first since I wasn’t using chalk paint (which doesn’t require primer), but I’m not gonna lie…I didn’t. I felt like this piece didn’t need it because it had a marble top, and the top is what would get the most wear and tear. Also, this wasn’t going in a highly trafficked area, but if your piece is then you should probably use a primer first. Let me tell you, I was really excited about the paint because I got it for FREE! Every few months or so, Ace Hardware has a “Find Your Soul Paint” event where you literally get a free quart of paint of your choice…no purchase necessary! I post these types of deals on Style Trials Facebook and Twitter pages, but you could also follow Ace Hardware just to make sure you don’t miss it. I went with Clark + Kensington flat paint in color Harbor Lane. It’s a really pretty pale blue. It dried super quick, so by the time I was done with the first coat I was able to immediately paint the second. The paint sponges helped to get into the little areas without being streaky. Now, I could have left it just like that, but I wanted a distressed look. Sometimes I think distressing actually makes a piece look more expensive, plus painted distressed furniture is really on trend right now. My living room is still a work in progress, so I quickly styled this for the after photo. I’m thinking not bad for $10! What do you think? Have you given a piece of furniture a makeover? This post brought to you by Moen, Incorporated. All opinions are 100% mine. With that, I’ve been researching and checking out a lot of cool products. I know I want to eventually redo my kitchen which is dated 10+ years, and am thinking new counter tops (probably granite), new appliances (hopefully sooner than later…the dishwasher is practically broken! ), and a new sink with a really cool faucet. My kitchen is just very standard, but adding these elements would make it look a lot better, plus increase the value to my home – overall a win, win! I’ll be getting stainless steel appliances which will hopefully update the look of my cabinets without having to redo those too, and want a matching faucet. My concern with stainless is usually the fingerprints, because that’s something I think will seriously annoy me. Does anyone have a good solution for that? 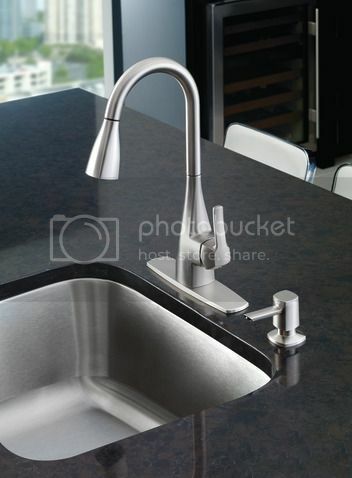 Well, I actually found a pretty nice kitchen faucet by a great brand, Moen, which is fingerprint resistant! The Kiran Spot Resist one-handle pulldown kitchen faucet would definitely add a sleek, modern look to my kitchen, and I like the high arc design. The features are pretty cool too. 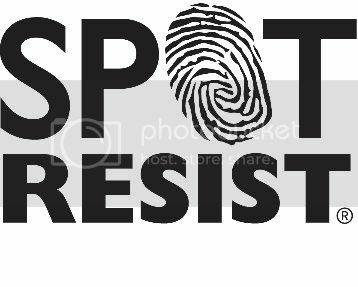 Fingerprint and water spot resistant…yes! Not too shabby! Plus, the Kiran Spot Resist one-handle pulldown kitchen faucet can easily be purchased at Lowe’s. Make sure to checkout Moen on FB and @Moen on Twitter for more info and options. How would you upgrade your kitchen, and how do you combat fingerprints/water spots on stainless steel?